Little Vegan Eats: Dinner featuring "Green Cheese"
Looking for a nice dinner idea for next weekend? My suggestion here is a bit involved, but all of the recipes are actuality quite straightforward. The cheese and bruschetta can be prepared in advance, and the gnocchi recipe I went with was very simple! 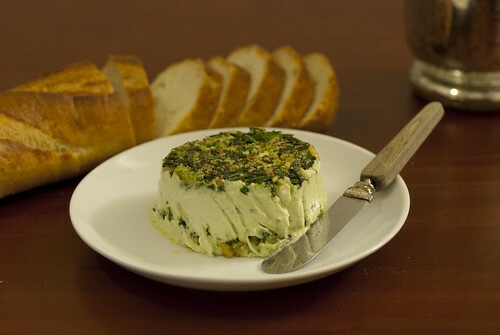 St. Patrick's Day is just around the corner, so I thought I'd try a green twist on some cashew cheese! This is an adaptation of the recipe from the Fork & Beans blog, which has some really terrific gluten, egg, and dairy-free recipes. I followed the recipe on the site, leaving out the sun-dried tomatoes, and adding some pesto and spinach for color (I used about four leaves of each, but you could add a bit more for an even deeper green color). I lined the bottom of a ramekin with plastic wrap, then added some of the pine nut pesto, as well as chopped rosemary and thyme (this layer became the top once released from the ramekin). I added a bit more pine nut pesto towards the bottom, and topped with a thin layer of cheese. I found that the original pesto recipe called for too much salt; I would have used just 1/4 tsp rather than 1 tsp. Otherwise, it was perfect! Although the green cheese was my "St. Patrick's Day dish..." I actually used it to accompany an Italian meal. It was a great appetizer! It went along perfectly with some bread and bruschetta (I can try to post a recipe for this sometime in the future--but it was just two tomatoes, half an onion, some basil, garlic, salt and pepper!). For the main course I made gnocchi, along with some garlic spinach. 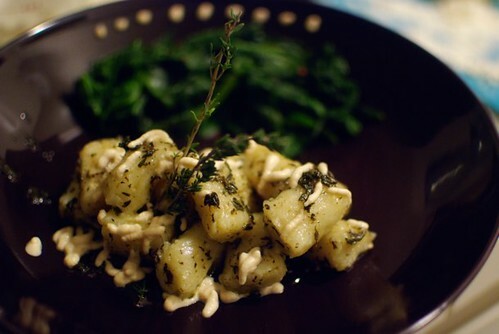 If you're looking for a gnocchi recipe, you can try VeganYumYum. She has a particularly good recipe for a thyme vinaigrette and lemon cashew cream. Although I made the cream and vinaigrette, I actually tried the gnocchi recipe from the Candle 79 Cookbook this time around. The recipe was fantastic: quite quick and very easy to follow. It really just involves baking your potatoes, mashing them, throwing in some flour, oil, and salt, and then shaping. Then you just put them in some boiling water for a few minutes and you're good to go! The gnocchi were delicious--light and (like all good gnocchi) pillowy. And for dessert? 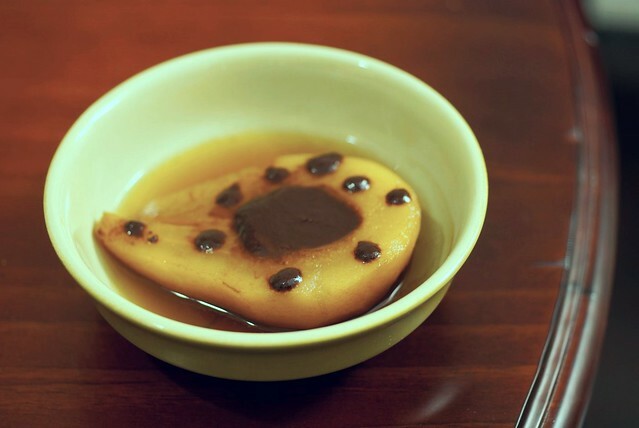 I tried the tea-poached pears with chocolate sauce from Veganomicon. This recipe was also very easy (pretty much just soak 'em in tea and sugar!) --next time I'd love to serve them with some ice cream!